The European Commission has released a preliminary view that accuses Google of breaching EU antitrust rules by abusing its dominant position on the market. According to the Commission, Google has been imposing restrictions on Android device manufacturers and mobile network operators. The State of Objectitions sent to Google say that the company has implemented a strategy on smartphones and tablets to preserve and strengthen its dominance in internet search. The reason behind this view is that Google Search is the preinstalled, set as the default, and in some cases exclusive search service in most Android devices in Europe. The Commission considers that Google is dominant in the markets for general internet search services, licensable smart mobile operating systems and app stores for the Android mobile operating system. There are also some remakrs regarding Google's attitude towards manufacturers. The company requires them to pre-install Google Search and Google Chrome browser, as well as settings Search as the default service on these devices, in order to have license to use proprietary Google software. Also Google doesn't allow manufacturers to sell smartphones or tablets running custom OS that's based on the Android open source code. A competitive mobile internet sector is increasingly important for consumers and businesses in Europe. Based on our investigation thus far, we believe that Google's behaviour denies consumers a wider choice of mobile apps and services and stands in the way of innovation by other players, in breach of EU antitrust rules. These rules apply to all companies active in Europe. 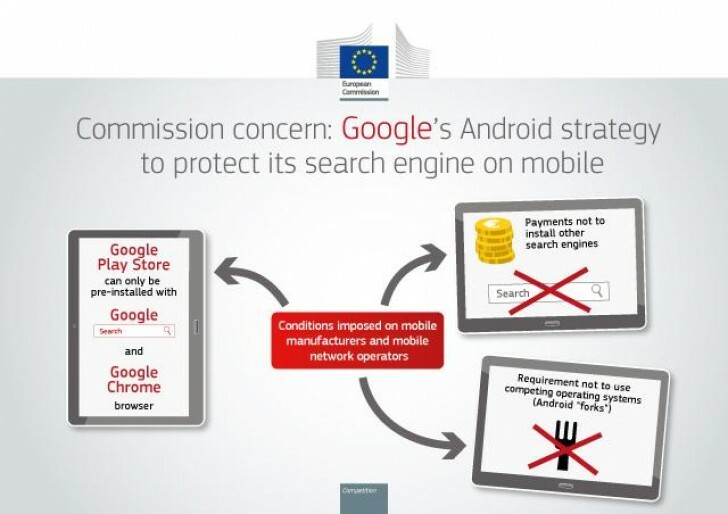 Google now has the opportunity to reply to the Commission's concerns." Android has helped foster a remarkable and, importantly, sustainable ecosystem, based on open-source software and open innovation. We look forward to working with the European Commission. Google has been given 12 weeks to respond. If found guilty, the company will face a salty fine and most likely be required to change its practices.